People often joke about "going with their gut" but the truth is that this part of your body exercises an astonishing degree of control over your mood, hunger, and general health. 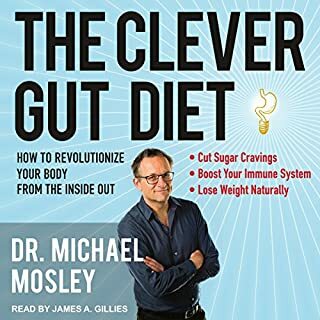 Written with the latest research on the microbiome - the alien bacteria that lives in our guts - The Clever Gut Diet also clearly explains what goes on inside your stomach and intestines every day. Discover up-to-the-date science on hunger hormones and learn how our "second brain" communicates with the rest of the body, shaping our appetite and immune system. It's good to be an educated dummy! Diabetes has a cause. That very cause means that there is something you can do for your condition. By understanding the disease and what causes it, you can change the results you see in your own body. Even in many advanced cases, diabetes can be reversed at least partially, with reduced dependence on insulin and diabetes drugs. Our modern diet, high in low-quality carbohydrates, is damaging our bodies - producing a constant overload of sugar in our bloodstream that clogs up our arteries and piles hidden fat into our internal organs. The result has been a doubling in the number of type 2 diabetics as well as a surge in those with a potentially hazardous condition - prediabetes. It is now known that even moderately elevated blood sugar levels can trigger heart disease, stroke, dementia, and cancer. Scientists have recently demonstrated that you can prevent and even reverse type 2 diabetes with a simple change in diet and lifestyle. Drawing on the work of professor Roy Taylor - one of the UK's foremost diabetes experts - and his own experience as a onetime diabetic, Dr. Michael Mosley presents a groundbreaking, science-based eight-week plan for diabetics who want to reverse their condition (and then stay off medication). He also offers a more flexible regime for people interested in the extensive health benefits to be gained from lowering their blood sugar levels and shedding dangerous fat. My wife, a diabetic, bought this book to see it would help her get off her diabetic medicines. and to lose weight. I was so amazed at her results, that I bought and have started following advice. She is lost so successful losing weight that she has now set goal to get to her weight from 26 years ago (pre-marriage). I so like this idea. She no longer needs to take her diabetic or blood pressure medicine. Dr. was so impressed, she wanted to know about book, so she could recommend to other patients. An added was my wife rosacea vastly cleared up, which she has suffered with all her life. I highly recommend this book. loved the entire book. everything was explained in simple terms and concepts. 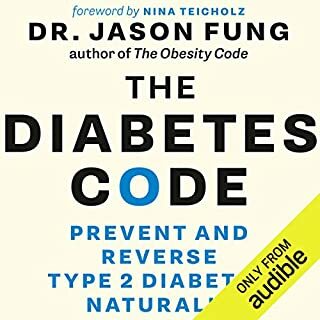 this is a must read/listen for anyone with diabetes symptoms. 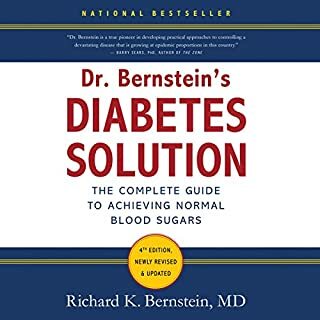 This book gave me the tools to bring my blood sugars under control. I lost 25 kg in 100 days, from a body fat % of 34.5% down to a body fat% of 21%. I've kept it off using fasting. 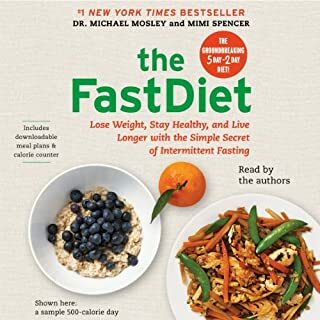 Dr. Mosley's 5:2 diet didn't suit me so I followed up with Dr. Jason Fungs work and do 4 days fasts every 4 - 5 weeks. I listened to this book in sections, often returning to a section for clarity. I did join the 8 WBD online diet, a waste of time and money, the support was poor. Also, keep well away from the BSD group/s on Facebook. They've nothing to do with Dr. Mosley and some of the advice runs in direct contradiction to his work. It's full of air heads obsessed with themselves, dress size, body weight not fat%. If you want to succeed, this book will your best tool. 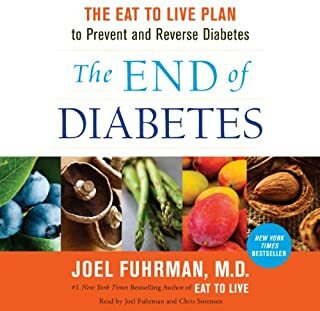 This was by far one of the best self help books I have read in controlling the eating habits and helping in becoming more aware and disciplined with the diabetes condition. The book is straight forward and easy to listen to with the basic foundational information to get started. I would strongly suggest if you will power is anything but type A to enroll into a local support group for best results. 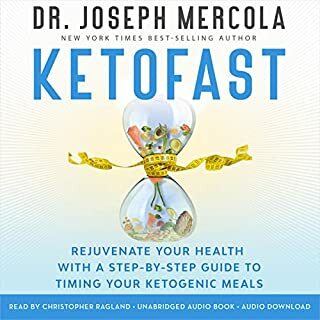 I started the program with a very aggressive 4 day fast (not for the faint of heart) as it kickstarted my system and made me respect the food with every bit.. The book dose not cover this material but his other materials touch on it. best wishes on your journey.. its is a 100 % recommended just wish it had a built in website blog etc as diabetes is so misunderstood and the doctor's are caught in the middle of big farmacutical and insurance protocol. Everything they discuss about the reactions of others is correctly portrayed. great method I think it will work. 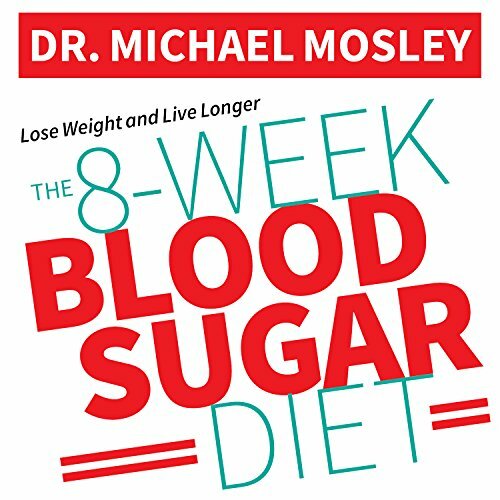 this is an excellent new take on how to manage your blood sugar. I am so tired of hearing about food pyramid in the past how it really screwed me up this is seems much much better. I got a lot out of this book and feel inspired to get moving on the 800 calorie plan. My frustration is with the Audible version. There are several times when he talks about lists or gives citations to websites but I listen to books while I’m driving so a lot gets lost. I also think the hard copy probably has reference sections at the end that aren’t included with the Audible version. The information was good but I really would have enjoyed more eating points than exercise points in the end. I have been recently diagnosed as a type 2 diabetic. This book has opened my eyes to alot of knowledge. It is very informative. I even bought the 8 week blood sugar diet cook book. I am feeling very hopeful that I too can lose the weight and kick this disease. Concise action plan! Really good advice, tips. Read very well...smooth and inflective.